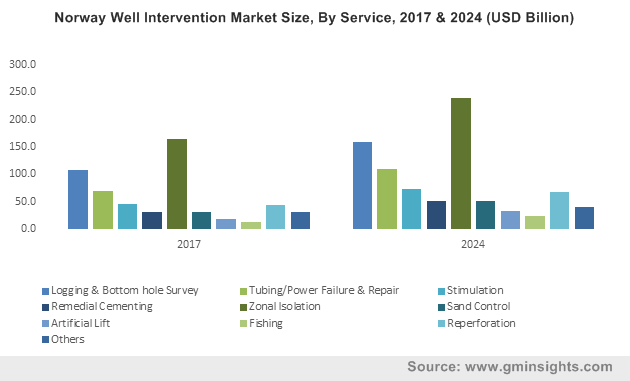 Well Intervention Market Analysis « Global Market Insights, Inc.
As increasing well stock reaches maturity, well intervention market is expected to traverse along an exponential trajectory due to the rising demand for stimulating well production. At present the oil and gas industry is one of the most influential branches in the world economy with more than 4 billion metric tons of oil being produced globally each year. The United States along with Saudi Arabia are among the world’s leading oil producers followed by Russia. In spite of the general trend for the support of renewable energy resources and sustainable options that have been reflected in legislations across the globe in response to the Paris Agreement to rein in climate change, projections in the petroleum industry has showed other indications. According to projections presented by International Energy Agency, global oil demand is slated to increase almost by a million BPD each year despite such trends as electric vehicles and renewables. This may be attributed to the rising overall population and the subsequent demand for petroleum. Maximizing the production of each well is therefore becoming imperative and the well intervention industry is gaining a massive impetus from such trends. The fact that well intervention market expansion is being considered crucial has been recently demonstrated in an incidence when energy giant Saudi Aramco invested £535,000 in the Aberdeen-based oil field technology company, Pragma Well Technology, through a three-year contract. Pragma is involved in using 3D metal printing in the development of a technological device that can be used in traditional well intervention to further extend the life of wells. Saudi Aramco’s investment in Pragma can be viewed as a venture to sponsor new methods to solve old problems but it clearly underlines the importance of bringing in new technology to the well intervention market so the productivity of wells that are almost at the end of their lives can be further extended, thus bringing in more profit for the oil and gas industry. Innovative solutions to well intervention have also added impetus to the well intervention industry. Recently C6 Technologies AS, a company that specializes in developing technologies related to well intervention and conveyance announced that it has used its ComTrac technology for the first time along with Archer, its parent company. The ComTrac is a notable technology as it facilitates intervention far beyond the capabilities of usual wireline technology in terms of length and load, particularly in the case of horizontal wells. ComTrac comprises a reel of semi-stiff carbon composite rod equipped with electrical conductors and is the only technology that can operate at lengths of up to 8 km. The carbon composite rod eliminates the problematic “stick and slip” experience faced with wireline cables and enables ComTrac to deliver exceptional data quality and repeatability. Other such innovations in well intervention market will also help augment the commercialization scope of oil and gas industry ahead. The oil and gas industry, when considered in terms of dollar value, is one of the biggest industrial sectors in the world and a powerhouse that generates hundreds of billions of dollars globally each year. It not only generates employment for thousands of workers but also significantly contributes to national GDP which has been made abundantly evident by regions that house major national oil companies. Though the world is now veering towards the adoption of alternative and renewable energy resources and basically trying to cut down on fossil fuel consumption, the general prediction shows that the time for oil and gas industry to lose its place of honor is still quite far away. With an estimation that 30 billion barrels of oil are consumed globally each year, oil accounts for a commendable portion of energy consumption, a factor that will continue to contribute the expansion of well intervention market. For the record, well intervention industry size is expected to record a CAGR of 6% over 2018-2024. This entry was posted in ENERGY, MINING, OIL AND GAS, Uncategorized and tagged Well Intervention Industry, Well Intervention Market, Well Intervention Market Analysis, Well Intervention Market Growth, Well Intervention Market Outlook, Well Intervention Market Pdf, Well Intervention Market Price, Well Intervention Market Report, Well Intervention Market Share, Well Intervention Market Size, Well Intervention Market Trends.